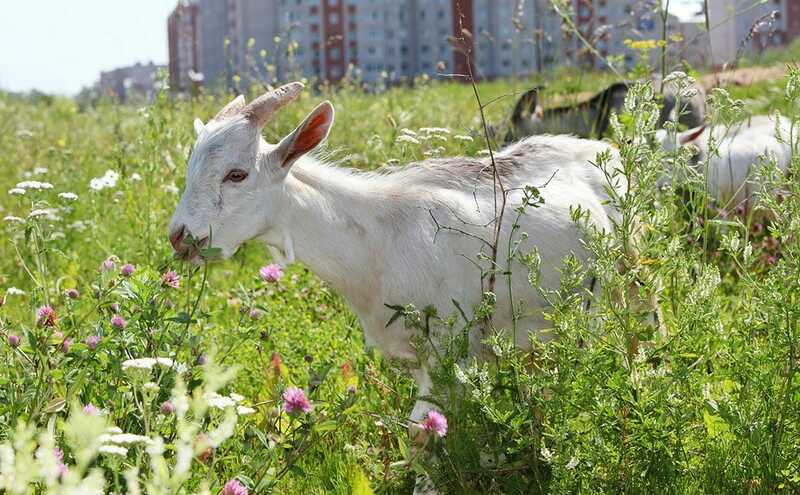 Dear Modern Farmer: How Do I Legally Raise Goats in the City? Don't break the law just for your goats. Weed control, cheesemaking and companionship are among some of the top reasons people are embracing backyard goats these days. But with lifespans that can range between eight to 12 years (or more! ), and their inquisitive and independent demeanors, it is important to consider these five factors before taking the plunge with a coupla kids. 1. Check zoning and other ordinances first. Before you get all doe eyed about the goats you want, you first need to determine if your city or town even allows goats in your zoning district. Ask your local zoning board office or building inspector. Since the goat craze is fairly recent, don’t be surprised if they are not entirely sure at first. Plus, in the case of goats and similar animals, zoning codes and other municipal ordinances are not always straightforward. Here’s why: many of them define words like agriculture, livestock, husbandry, domestic animals, and/or grazing animals – and often include goats within those definitions – which may be allowed in some zoning districts (like agricultural) and prohibited others, like residential zones. To make it even more confusing, some codes prohibit agriculture as a “gainful business” or commercial enterprise in residential zones, but leave open the question of whether agriculture and the like are allowed for personal use. This is where antiquated zoning ordinances often cause confusion, both for landowners and the authorities interpreting the rules. Because animals are usually regulated in several ways, you should also check some of the general city/town ordinances or bylaws, particularly those dealing with nuisance and animal control to determine whether goats are dealt with there too. In at least a few communities, goats are expressly prohibited as a “nuisance animal”. It is worth mentioning here that, in some cases, goats have been deemed acceptable even when they are not actually authorized. For example, a Federal Way, Washington state girl dealing with anxiety has been able to keep one pygmy goat under the guise of a doctor-recommended companion animal; despite much resistance from neighbors, she is trying to get her second goat back. Other goat owners have not been as successful in having their health-related arguments accepted by officials or the courts. In Agawam, Massachusetts, one couple owns 15 goats whose raw milk helps diminish the effects of irritable bowel syndrome suffered by the wife. City officials argue that the goats are not allowed. This has resulted in not only more than eight years of litigation in the state’s Housing Court, but also another case pending in state Land Court, and, most recently, the couple filed a $2 million lawsuit in federal court alleging discrimination and civil rights violations. 2. Check your homeowners association or condominium rules. As I noted in a similar question about front yard gardens, even if your city/town allows goats, you may be subject to stricter regulations if you are part of a homeowners association or condominium development, so check there too. · only personal consumption of any goat-derived food products – no sales! It’s likely that your community will not be as ahead of the curve as San Diego when it comes to spelling out what is required. This does not mean anything goes. Determine as best you can what zoning does require, and fill in the rest with best goat management practices that make sense for the size and location of your property and neighborhood density. It might go without saying, but also keep in mind your future plans. If you plan on moving anytime during the typical lifespan of the goats you intend to keep, you will need to either take them with you (i.e. the next community will need to allow goats too) or find another home for the goats. This is a big part of responsible goat ownership. Let’s not have goats become the new surrendered chickens. If you happen to live in a community where goats are not allowed, you may want to check out this thoughtful Grist piece, written by Jennie Grant (president of the Goat Justice League and author of City Goats: The Goat Justice League’s Guide to Backyard Goat Keeping), outlining how to go about changing the laws in your favor. Surely if the twelve year old girl from Federal Way can try to legalize goats, so can you! 4. Don’t be a nuisance. Do your research on which goats will work for your lifestyle and location. Some breeds are louder than others. Loud goats may become an actionable nuisance to neighbors, which can result in a citation (or worse) for you. The same holds true for things like goat manure and untidy enclosures which, if left unchecked, can lead to flies and smells that can also land you in hot water with local authorities or a judge (like this extreme situation in Centerville, Pennsylvania). Do your research on which goats will work for your lifestyle and location. Some breeds are louder than others. One important thing to consider is your potential liability and insurance coverage if your goats create property damage on your or another landowner’s property. Goats have been known to eat neighbor’s (often very expensive) landscaping because they are smart enough to get past some gates and fences, just like this Nubian did in Rye, New Hampshire (as recently reported here, the goat’s owner failed to show up in court and is now subject to a default order that could potentially result in suspension of his driver’s license if he does not address the legal citation promptly). And let’s not forget all of the money you will need to invest in proper enclosures and structures that not only have to withstand the elements but those brilliant, bucking Bovidae. These kinds of scenarios give insurers the billies, I mean willies. So, to be safe, make sure that your homeowners insurance policy covers those potential risks, and, if it does not, whether the carrier offers this kind of coverage via riders for agricultural or hobby farm use. Otherwise, you may have to pay a lot of money out of pocket to replace your neighbor’s Japanese maples.